The FlightGear Autopilot is a modular system to some extent based on PID controllers. Here are some tips to help tuning such a controller. There is lot of documentation all over the Internet about how to tune the parameters, having this you will have to figure out how the FlightGear PID controller implementation works. First of all, have a look at the code where you will see the algorithm which is used for our autopilot. Checking existing autopilot configurations in FlightGear aircraft will also help. There is actually a doc about filters in FlightGear documentation. Filters can be applied on input or output values, in other words, before and after the PID controller (execution). In any case the ‘dt’ values seen by the autopilot PIDs should always be the FDM rate which is usually 120Hz. — James Turner (2015-05-14). Re: [Flightgear-devel] George is not happy. Knowing the algorithm is mandatory, certain values are forbidden, for example they can lead to a division by zero. Then you will have to understand where the parameters apply to act on the chosen correction module. See the schema which is a good reminder while testing. While it's possible to tune a PID controller by testing directly the aircraft behavior under the autopilot control, it can be really useful to get everything in graphical view. First of all you'll have to turn the PID Controller's debug mode on. That is in the autopilot.xml you are working on. (I didn't try to turn on more than one PID controller's debugging support at the same time). # prints: "input reference P I D output"
If you use Linux, You can run Kst simultaneously to read the datas on the fly and watch them displayed together in real time while testing the aircraft. Feel free to prepare %fg-root%\preferences.xml to your desired needs if you plan to start at another location (instead of KSFO) or with another plane (instead of Cessna 172p) or if you want to change other options. As an alternative use the command line options to modify the start-up to your desired needs. 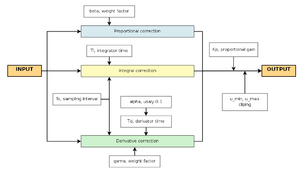 The following part describes the visualization of the debug output with Live Graph. 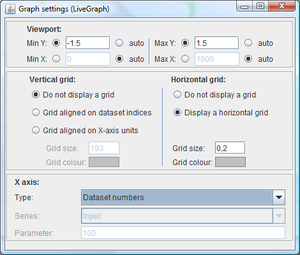 Live-Graph is a GPL'd Graph Plotter for Windows systems available at Sourceforge.org. After installing it start Live-Graph and set the Data file to your output logfile (e.g. "my_file"). Be aware that you don't have an output file before you did not start the process of debug output at least one time. In this case start FlightGear first and activate the AP function on the autopilot where you activated the debug=true output. 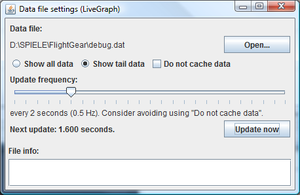 Back to Live-Graph: The update frequency works fine with updates at 1 Hz or 2 Hz (every 1 or 2 seconds). Activate "Show tail data" so that your graph will not be overcrowding during the time and keep caching data active or you will experience loss of data which will make your tests useless. Next you need to define the visual output: set the viewport on the Y-axis from min. -1.5 to max. +1.5. Leaving the scaling to "auto" will create a graph which will not be very easy to read. X-axis set to auto on both sides. It's quite handy to set the horizontal grid (I prefer a grid size of 0.2 to 0.5). And last but not least on X-Axis set "Dataset numbers" as type for the input. In the Data series window you can switch the single values on and off and define the way how the program should plot the data. Here in the image I acquire the data of a simple wing leveler and therefor I normalize all data to values between 0 and 1. Be aware that my settings are not mandatory. Be creative and play around with different settings until you feel satisfied with the plotted data. With "debug" in your AP.xml set to "true" you will now get the logfile filled and step by step the data will be visualized in Live-Graph. 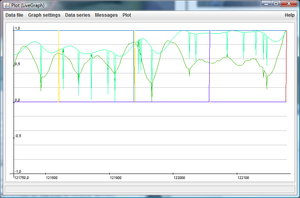 Now it's time to preset the autopilot to an initial value and to start the testing. As an alternative to using the controller's debug output you can use the built in logging system of FlightGear. This can be configured through the preferences.xml file, or at runtime via the File->Logging menu option. To tune a controller you would typically display the setpoint property and the controlled property in the same graph. Another property that is interesting too look at is the actuating property, which can be for example the aileron control or the elevator control. RTO-TR-029 - Flight Control Design - Best Practices (pdf). Published by NATO Science and Technology Organization. Retrieved 29 Aug 2015.
Cooper, G. E.; Harper, R. P., Jr. (1 Apr 1969). NASA-TN-D-5153 – The use of pilot rating in the evaluation of aircraft handling qualities (pdf). Published by NASA Ames Research Center. Retrieved 19 Sep 2015. – The source and use of the Cooper-Harper pilot ratings largely still in use today. Robert P. Harper Jr.; George E. Cooper (1984?). Handling Qualities and Pilot Evaluation (pdf). 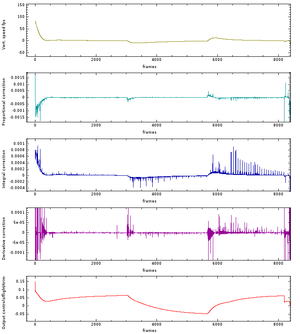 Retrieved 19 Sep 2015. This page was last modified on 8 March 2016, at 12:29.